(Bloomberg) -- Indonesia’s aviation safety regulator confirmed an off-duty pilot was aboard a Boeing Co. 737 Max 8 a day before the aircraft crashed, after people familiar with the matter said that a third person was in the cockpit and helped the crew disable a malfunctioning flight-control system. The pilot has been interviewed, but his name and what role he played in saving the aircraft weren’t spelled out Thursday in a briefing by National Transportation Safety Committee Chairman Soerjanto Tjahjono. The NTSC won’t release details until the investigation of the Oct. 29 crash of Lion Air Flight 610 is completed, Tjahjono said. The twin disasters, the latest occurring earlier this month, led to a global grounding of the jetliner, with the U.S. notably behind the rest of the world. The Federal Aviation Administration has since been under scrutiny over its certification of the plane. In the wake of the two accidents, questions have emerged about how Boeing’s design of the new 737 model were approved. The U.S. Transportation Department’s inspector general is conducting a review of how the plane was certified to fly. 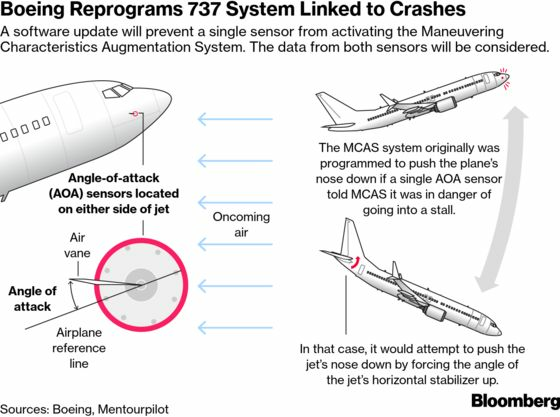 After the Lion Air crash, two U.S. pilots’ unions said the potential risks of the system, known as the Maneuvering Characteristics Augmentation System, or MCAS, hadn’t been sufficiently spelled out in their manuals or training. None of the documentation for the aircraft included an explanation, the union leaders have said.